Just your average sink here. There’s nothing wrong with it at all, I mean it definitely got the job done, but it was time for this sucker to hit the road. 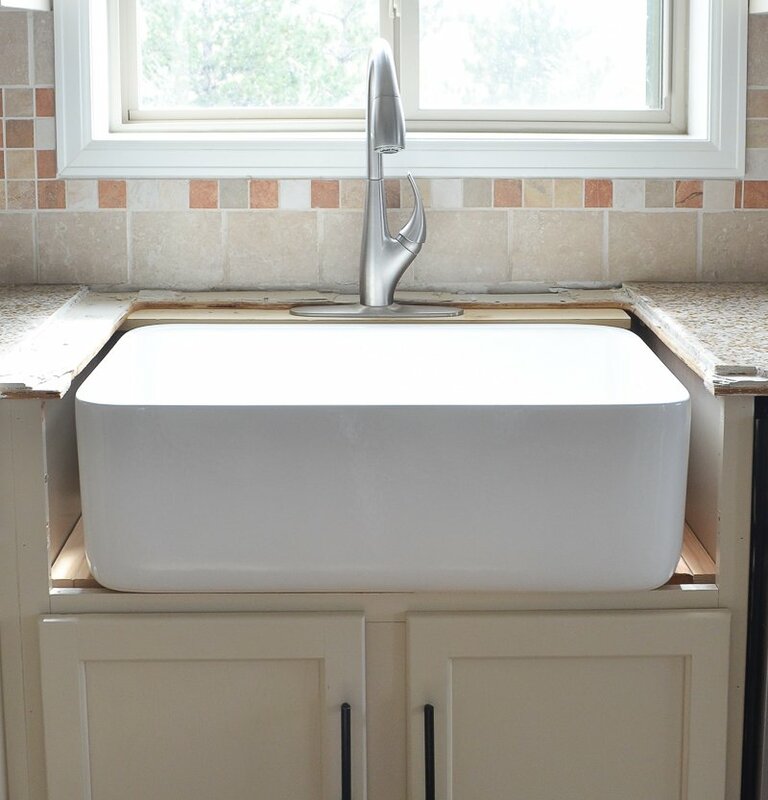 We chose the Bradstreet design farmhouse sink from Sinkology. 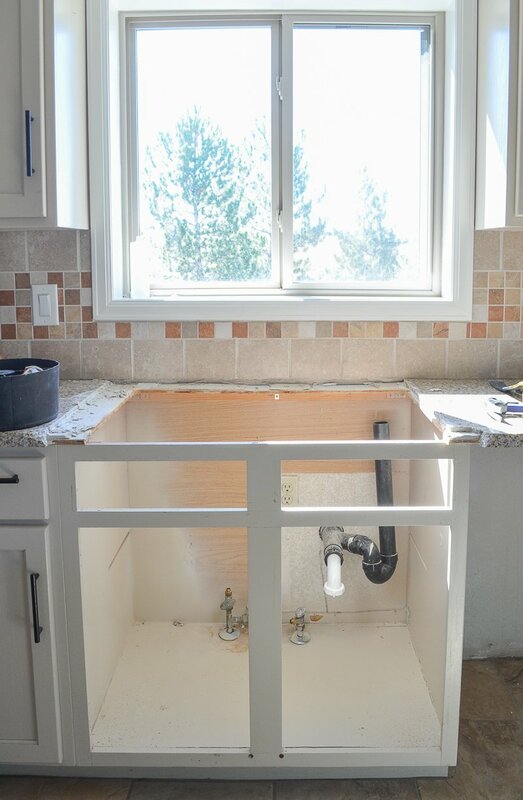 And since it’s an undermount sink, the first step was removing the backside of the countertops and then taking out the old sink and the doors on the cabinet below the sink. We also disconnected the plumbing and drain lines, as you can see here. And since our dishwasher was right next to this cabinet, we also had to take that out in order to install the supports–which was the next step. Since the sink is crazy heavy, we had to build these 2×4 supports in order to hold it up. 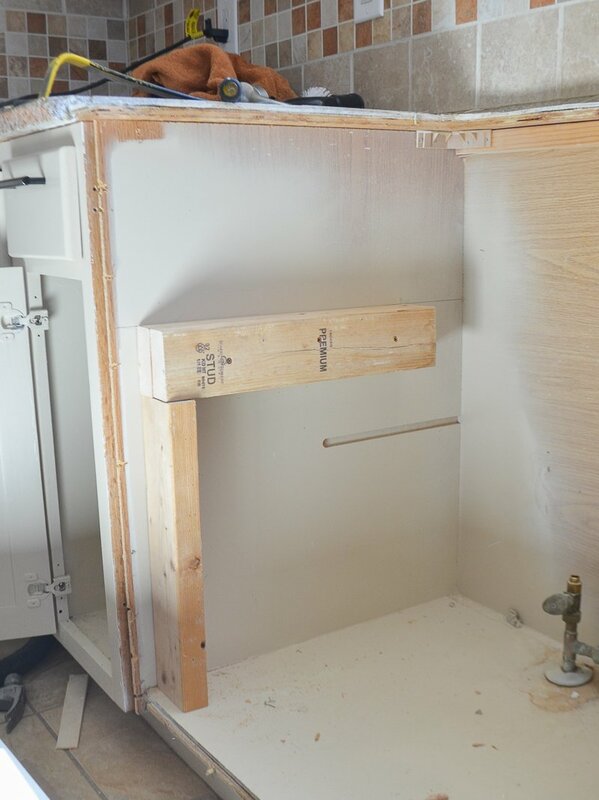 This part was pretty straightforward, we just had to make sure the supports were level and at the correct height for the sink to sit right below the countertop since it is an undermount sink. Each support is screwed directly into the cabinet. Obviously we had to get creative with the faucet situation until our new countertops are installed soon. Since this is an undermount sink the faucet will actually run through the countertops, so my husband put a 1×4 back there behind the sink and ran the faucet through there for now. Obviously it looks a bit ridiculous, but it works for the time being. Soon enough we will have new countertops and we’ll be able to install our new faucet, which is also from Sinkology. We obviously still have a ways to go here, but getting this installed was a huge step in the right direction. 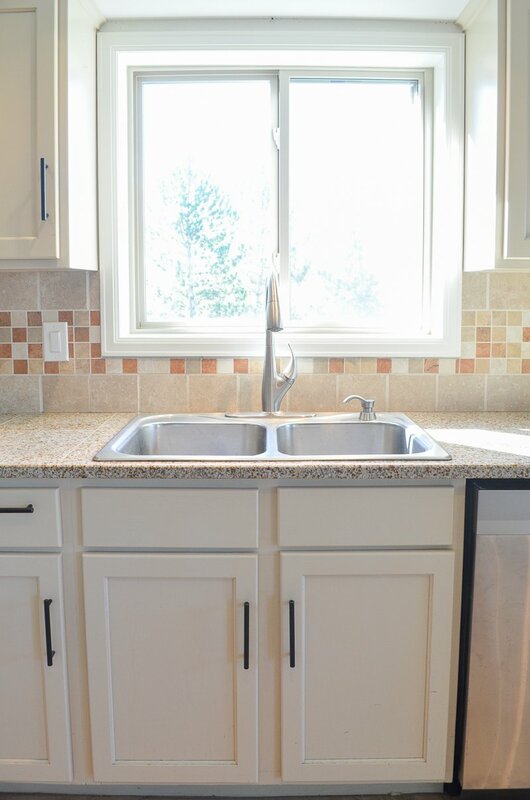 We still need to put fillers pieces in between the cabinet and the sink and get the new faucet installed once the countertops come, but those things aren’t too far off. I’m hoping we have everything done in just a few weeks. And I thought about waiting to share this with you guys until things looked polished and completely finished, but the reality of living in a fixer upper is that you’re often doing big projects like this in phases. It slowly comes together over a period of time and I like sharing that process with you. I hope you like seeing it too. And even though our kitchen is far from finished, just having this farmhouse sink in place gives this room a whole new feel. I love it and I can’t wait to get everything finished soooooon! 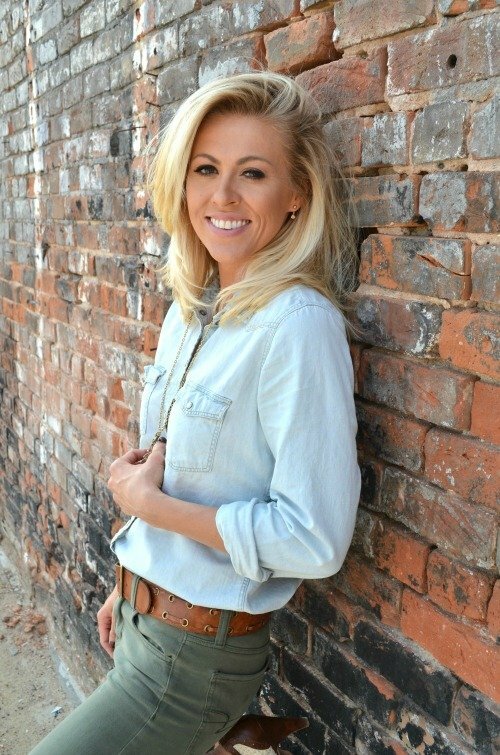 Thanks so much for stopping by the blog today. I hope the week ahead brings lots of wonderful things your way! Kitchen Progress Update: The Passthrough Reveal! 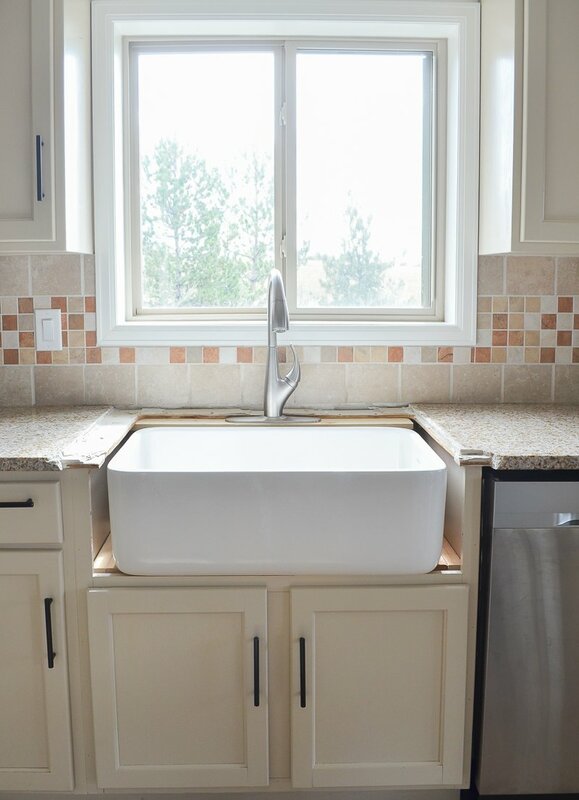 Looks great – we just put a farmhouse sink in as well and I absolutely love it!! Can’t wait to see the finished product, it looks good now.. Thanks Teresa, I can’t wait to get the rest of the kitchen finished! Beautiful choice of sink. Can’t wait to see the finish project. Thank you Loretta, I can’t wait to be done! Thanks Sheila! I love copper farmhouse sinks too. Definitely check out Sinkology, they have several awesome copper sinks. Wow Barbara, you’ve sure been busy working on your home. Sounds like you’ve done a lot of amazing work so far. And you’re right, the hard work pays off and it will be so nice to enjoy when you’re done! Looks great! Can’t wait to see when it’s all finished! Thanks for sharing! So is the sink functional right now and you are using it? I’m so glad you are getting to your remodel before me (I have everything ready to go as far as design and financing set up, but just need to find the time which has been the biggest hold up.) That way I can just copy your look, which I’m so in love with! I love the sink btw! I’ve looked at a couple other designs, some significantly cheaper, but it looks like I should save up for one like yours cuz I like this look so much better. Thanks for sharing your progress. I kept checking IG all wkd looking for updates as I was living vicariously and so excited! Yep, it’s functional right now. Not necessarily pretty with the faucet situation we have, but at least it’s functional. How exciting you’re getting ready to embark on your own kitchen remodel. Good luck with it! Dreamy!! So beautiful and how lucky to have a handy hubby that could do this project!!! 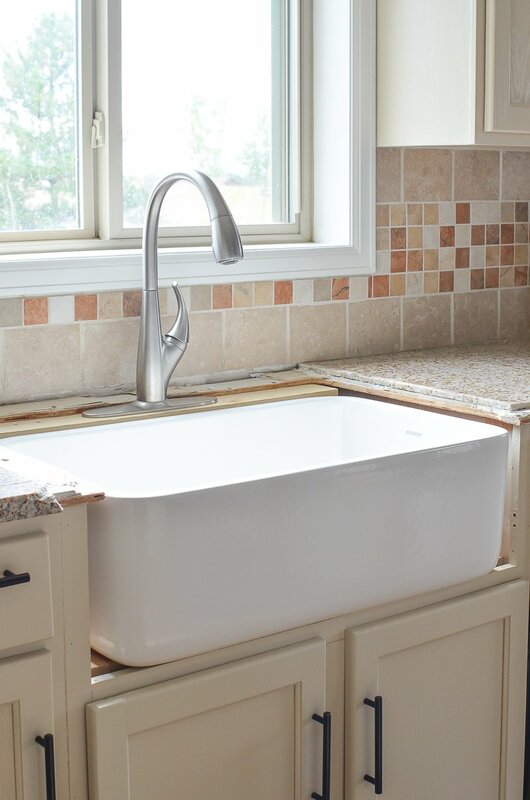 I so badly wanted a farmhouse sink when we updated our kitchen counters. Just couldn’t do it with the need of a contractor and cabinet builder. This is beautiful and I can’t wait to see your remodel and the finished kitchen 😍 Great post and it looks easier then I thought! Thanks Sonya! I am lucky to have such a handy husband for sure. Although he might not feel so lucky. haha! 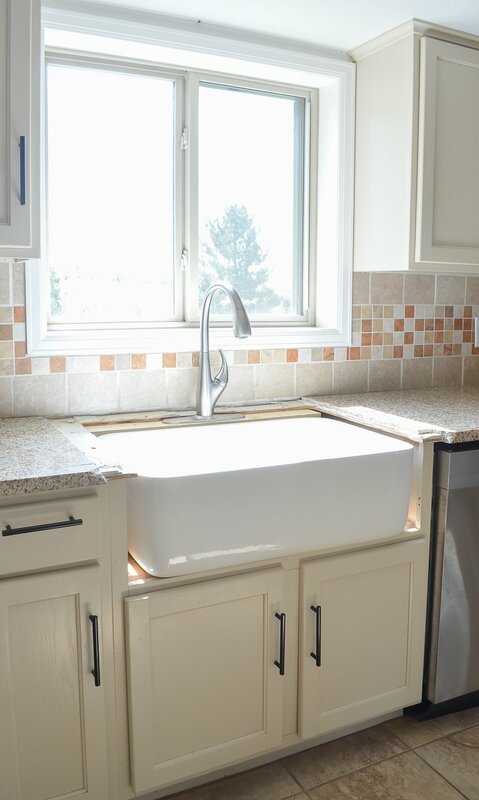 I love a farmhouse sink!! Do you know yet what you are doing for countertops? We are planning on quartz. Can’t wait to get them in! 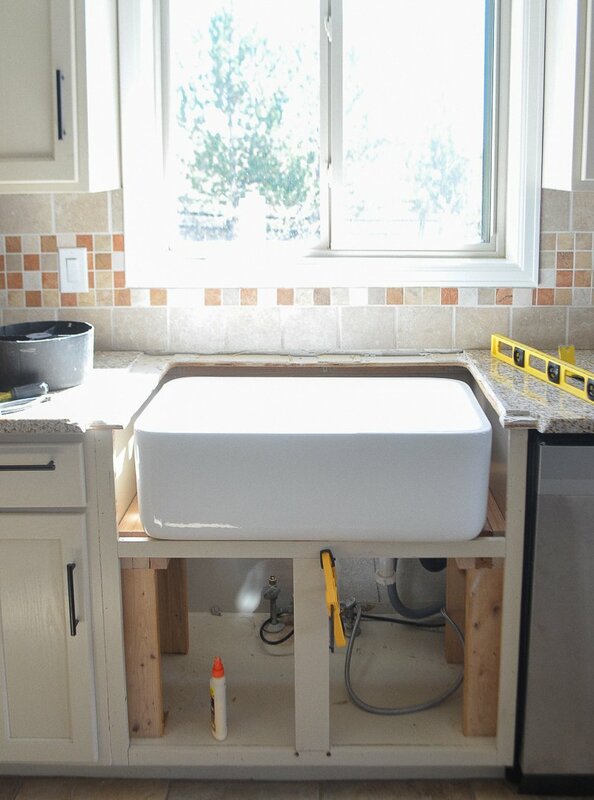 I’m so envious…I want a farmhouse sink so bad, but my house is only 11 years old and I can’t get my hubs to agree to ripping apart my kitchen just yet. Hopefully one day! 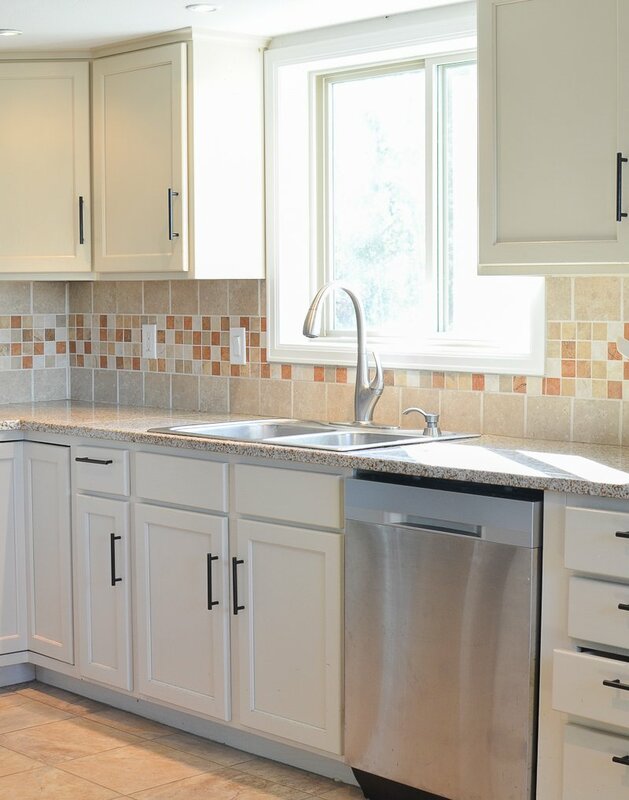 Anywhoo, your sink looks awesome and your hubby is so talented, the cabinets below the sink look perfect…great job! 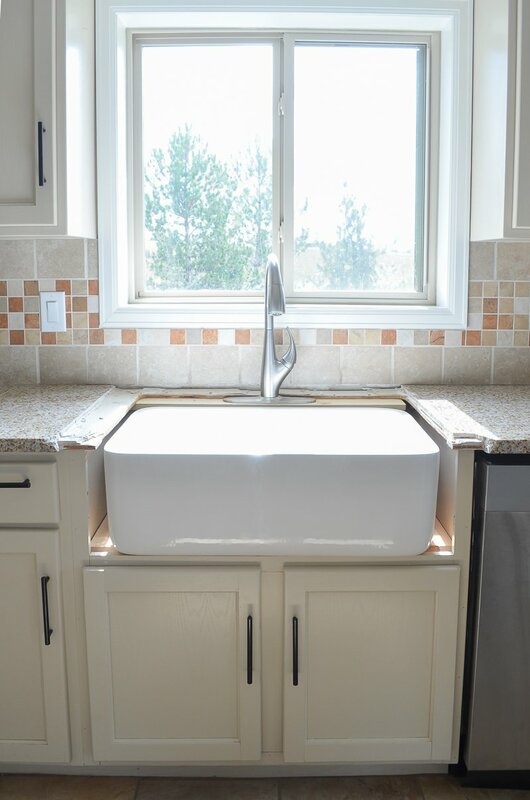 I love the look of your new sink, but I’m afraid I would have trouble getting used to not having a double sink. Old habits die hard, I guess! It’s looking awesome so far Sarah!!! Thank you so much Kellie, I can’t wait to get it all done!! That looks amazing! 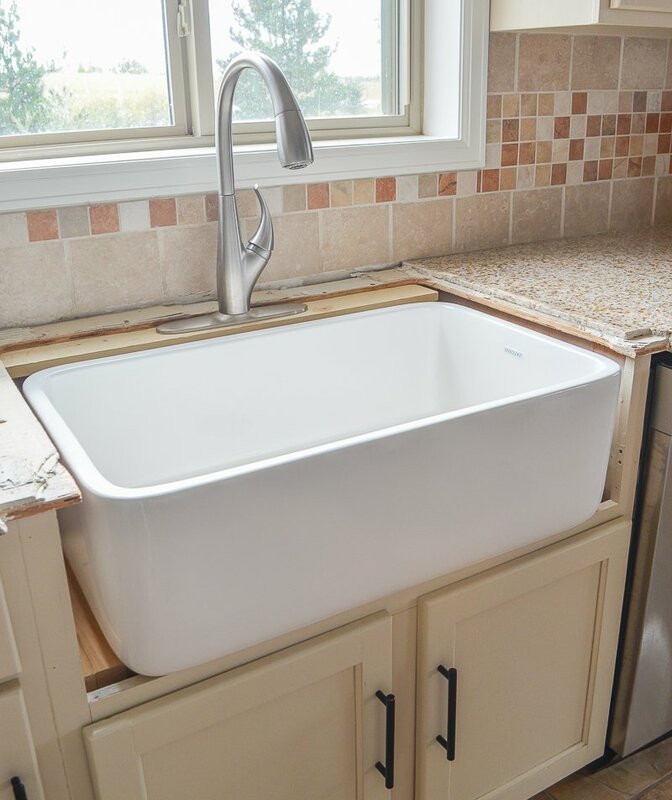 I would love to have a farmhouse sink…. Just concerned with how to put it in as we would also be doing it ourselves. Do you have any photos or info of how you trimmed it out? 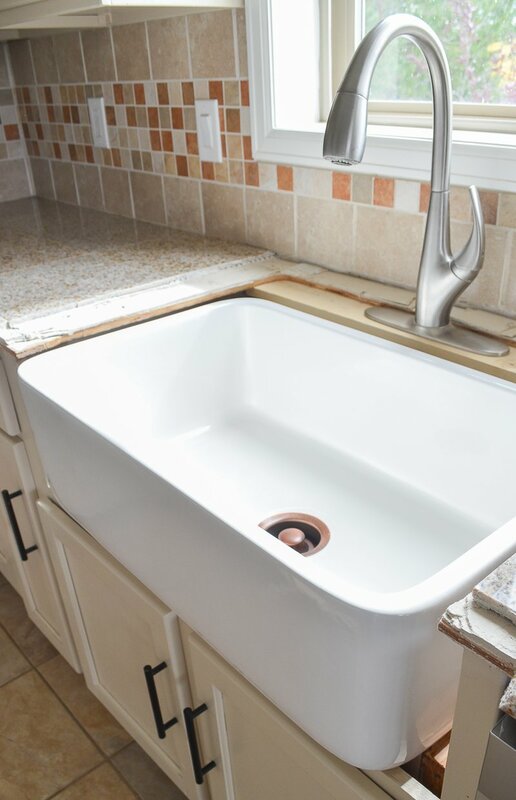 Your blog was the first to make putting the sink in ourselves actually doable. Thank you!! !